Honestly, I’ve spent most of my life running away from being Jewish. I read Richard Dawkins. I watch Bill Maher. I date Catholic girls. I listen to rock ’n roll. Who needs the Torah when you’ve got Tom Petty? Also, I began doing stand-up comedy. To find your comedic voice, you’re constantly looking for what’s authentic about you. And comedy crowds have a strange wisdom. They see through you. They tell you every night if you’re being authentic or if you’re just reciting some lines. And I noticed that when I talked about being Jewish, audiences responded. It felt like there was something true there. And as I got deeper into stand-up, I realized how many of my comedy idols were steeped in Judaism. Larry David (when accused on Curb of being a self-hating Jew: “Let me tell you something; I do hate myself, but it has nothing to do with being Jewish.”), Woody Allen (“Life is full of misery, loneliness, and suffering—and it’s all over much too soon.” ), Richard Lewis (“My grandparents had a satellite dish. They were the first ones, like, in 1961. It was like a Jewish one: It picked up problems from other families.”), Jon Stewart (“Sukkot is a Hebrew word meaning ‘how many holidays can Jews fit into one month?’ The answer, of course, is ‘I can’t be in tomorrow. It’s a Jewish holiday.’”), Howard Stern (his daughter is an Orthodox Jew!? ), the Marx brothers (Groucho shows Chico a map: “And over there are the levees.” Chico replies, “Ah, dats-a da Jewish neighborhood.”), Garry Shandling (“My friends tell me I have an intimacy problem. But they don’t really know me.”), Mel Brooks (“May the Schwartz be with you.”), and on and on. Sure, they all have different styles. Some barely even talk about Judaism. Yet still, they all seem thoroughly Jewish somehow. It’s in the way they turn over an idea and look at it. The outsider point of view. The neurosis. The strange obsession with justice. It feels like they are teaching Jewish values but in a different, subtle way. Then things started getting heavy in my personal life. My parents passed away. First my mom (stroke) and then a few years later my dad (cancer). Death gives you clarity. You realize all the crap you normally think matters doesn’t at all. You want to be connected to something larger. My Dad grew up in Israel but I rarely heard him speak Hebrew. But during his final days, he was on a ton of morphine. He began to speak Hebrew even though no one around him understood what he was saying. His mother tongue was coming out. The part of him he never showed was emerging. It had been in there all along. He also kept thinking there was powder in his hands (there wasn’t). “I want to put the powder in my tea,” he said. So I’d play along and get his mug of tea and place it under his hands. He dumped this invisible powder into the glass. He felt better after that. Later he offered me some powder. “It’s for you.” And I’d carry away his invisible powder. As all this other stuff was happening, my nephew was growing up. I’d visit and we’d light the candles for Hannukah. And I heard him say the blessings that I said as a child. The same words I had spoken and my great-great-great-grandfather had spoken. It felt like we were all part of a stream, joined together by ceremony, ritual and the stories Jews tell. I started to see how previous generations rhyme with future ones. Then I dated a Jewish girl for the first time in my life. “It will never work out between us. You know that, right?” she asked me on our first date. She didn’t realize that was catnip to me, a man attracted exclusively to women who are emotionally unavailable. It didn’t last, but, nonetheless, something felt right about it while we were together. Like our ancestors would have gotten along. I’d never felt that in a relationship before. After that, I thought more about how much I’d been influenced by Jews. I saw Leonard Cohen live and felt blown away by how he combined faith, lust, humility and poetry. I listened to Bob Dylan’s “Gotta Serve Somebody” on repeat. (“Well, it may be the devil or it may be the Lord / But you’re gonna have to serve somebody.”) I went to London and sat in a room full of Mark Rothko murals—an immersive, spiritual experience. The writing of Michael Pollan changed how I eat. Jews kept popping up. So eventually, I started thinking I should examine the Torah and how Jews are made: If I enjoy running the app so much, I should look at the source code. So I decided to give Torah study a try. Two years ago, I started meeting with a Rabbi once a week to discuss the Torah. At first, I challenged him. People really lived to be 700 years old? C’mon! The ark really carried all those animals? Seriously!? But eventually I chilled out with the gotcha questions. They seemed besides the point. 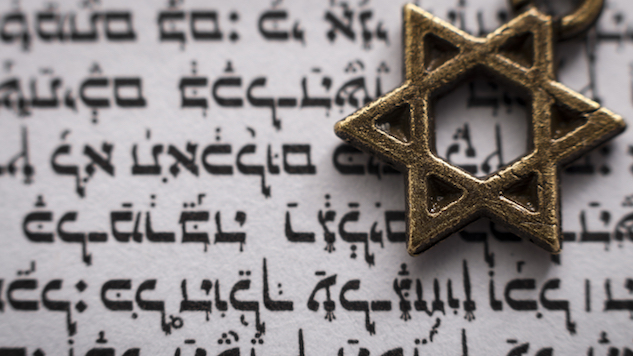 Instead of taking it literally, I’ve come to see the Torah as a blueprint for faith. Even if it was all invented by some ordinary dudes, I’m not sure that’s any less incredible. There’s no clean ending here. I still tell jokes. I still struggle with Judaism. I know more but I don’t follow the rules. Not sure I ever will. But something that seemed fuzzy feels more in focus. I feel more connected to my roots. I feel like I understand, just a little bit better, the invisible powder that one generation of Jews hands to the next. Matt Ruby is a NYC-based standup comedian and the creator of Vooza, a video comic strip about the tech world (called the “The Spinal Tap of startups” by Mashable). His debut album Hot Flashes is available now. Twitter: @mattruby.